Manti is the closest, you can get to, what you in Italian know as ravioli – that small packages of pasta filled with all sorts of goodies. Manti is a really nice Sunday project – or at least a project for the day, because Manti takes a long time to make – as in really long time! If you can charm a few girlfriends or a group of food enthusiasts to help you make these delights, it’s even better. For I warn you, you are going to use some hours on this project – especially if you need to make a big portion. I made Manti for 4 people (2 children and 2 adults) and there was just barely enough. My dear family were explicitly told to enjoy every single bite, which they really tried to for the full 15 minutes, it took them, to chew through these delicacies. And it took me 3 hours to sit and fold them! But they were worth every one minute (it probably took me a little extra time to fold them,since I’ve never try it before. Once I got hold on it, it went okay quickly)! And if you finally gather the courage ant time, the make them, then you might as well make a whole bunch and then freeze a little. They will last in the freezer for about 3 weeks. 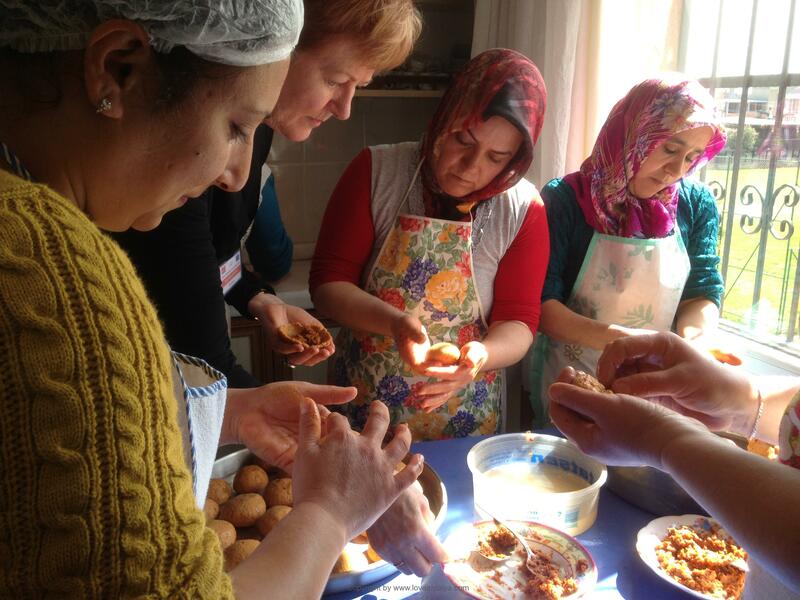 Yes, there is a reason, why Turkish women in the villages often gathers and make a huge portion. In this way, they make food for all, drinking tea together and sorting out the whole world situation (and tipped about the village). If Manti reminds you a little of the small crispy dumplings (just without being crunchy), that you can get at ex. Chinese restaurants, it is not entirely wrong. 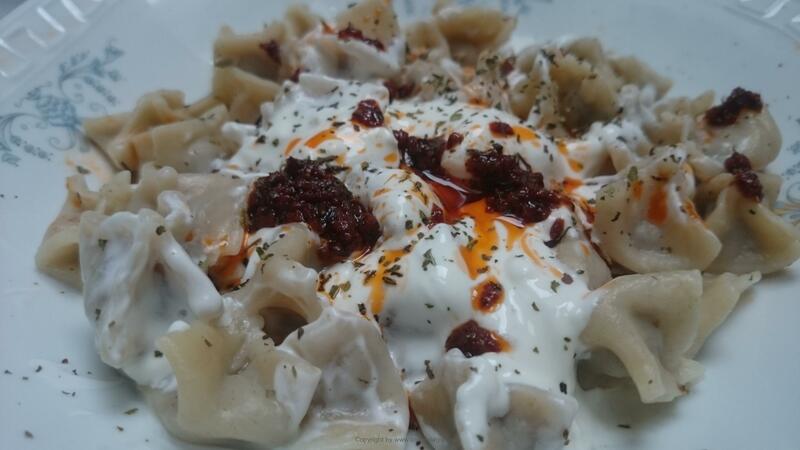 Manti (which also was called “mantu”) was brought with the Turkish nomads from Central Asia, and one can still find them in different variations in Asian, Afghan, Armenian, Caucasian and Chinese food culture. In most regions of Turkey, these little packs are a central part of the kitchen, and you can get it in most places and in almost the same variation – with garlic / yoghurt sauce and a strong butter or oil with spices, as a topping. The quality may vary. I’ve got the most delicious homemade ravioli in several restaurants, hotels and private homes in Antalya, but also tasted the most miserable, watery version at a tourist trap of a restaurant in Istanbul. If you really do not want to make Manti yourself, you can also buy a freeze-dried version, from the local ethnic greengrocer. But it is not the same. My first experience was happily at home with my husband’s grandmother – and lucky me. She was one of those tenacious Turkish “village mothers”, who had made this dish many, many times, and I cannot say I was sorry. Although the idea of garlic and yoghurt combined with meat and pasta, sounded really strange in my Scandinavian food view, it is a heavenly mouthful, full of flavors. Just try it. This recipe is for aprox. 4 people ( make further ½ portion if you serve for 4 adults and no other sidedishes). Sieve the flour and salt into the bowl, mix the rest in and knead well (I use a mixer with a dough hook the first few minutes – and then by hand, but you can also knead it the old-fashioned way on the kitchen table). The dough should be knead really well – about 5-8. minutes until it’s smooth and elastic, but still tight. Cover the bowl with a damp cloth and set aside for about 30 minutes in a cool place. Meanwhile prepare the filling. Just put everything together and mix thoroughly. Cover and place it in the refrigerator, until you’re ready. Make the yoghurt sauce by squeezing the garlic into the youghurt. Put it in the refrigerator, until you have to use it. Now you need to roll out the dough – and it must be very thin. You do not want to sit with such a lump of soggy dough inside your mouth, when you eat. I prefer to roll with such a heavy roller without handle – the name is probably something fine, but I don’t know. It is heavy, it’s so easy to work with and I think it rolls slightly thinner than others. I brought my home from Paris (Can you imagine how people looked, when I happily walked around with my murder weapon in my bag, on my way through the streets), but naturally , you can use whatever you have. You just roll thin, thin, thin – that is equivalent to a millimeter or two! Cut the dough into 3 pieces and rollout one piece. Sprinkle a little flour on the table, but be careful with it. The dough dries out really quickly (remember to keep the other two lumps covered with the wet tea towel). 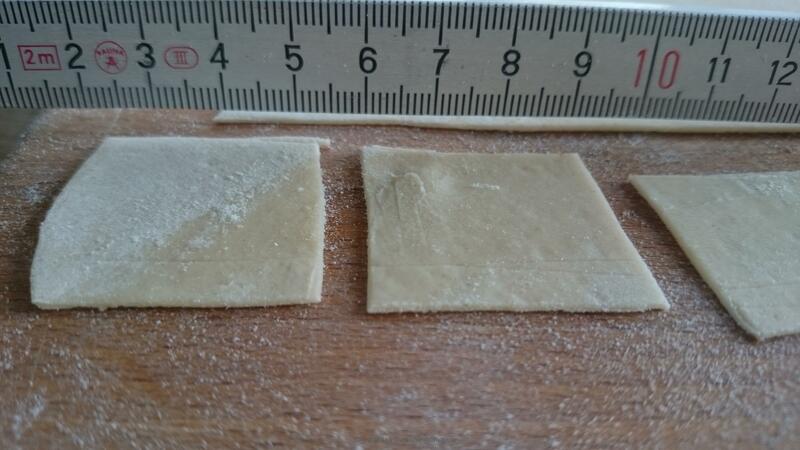 Cut the dough into 3-4 cm cubes and put a bit of the filling – equivalent to aprox. ½ chickpea-size, on each cube. Gently fold each corner against each other to form a small package and press the edges lightly together. Put them close together on a baking sheet with wax paper. Continue until you have no more dough. 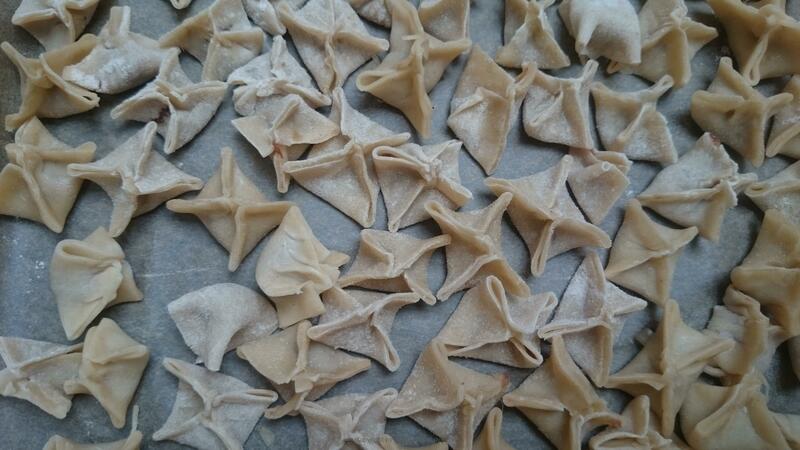 Bake the Manti/ravioli at 180º in the oven for about 10 minutes, until they are lightly golden. Take them out and then freeze a portion, if you have made enough. Cook the ravioli in boiling, salted water for about 10 minutes until they get soft. Meanwhile prepare the topping. Heat the oil in a small saucepan. Add pepper paste (put you can do without) and chili, Sumak and mint and grate quickly – it takes 1-2 minutes. 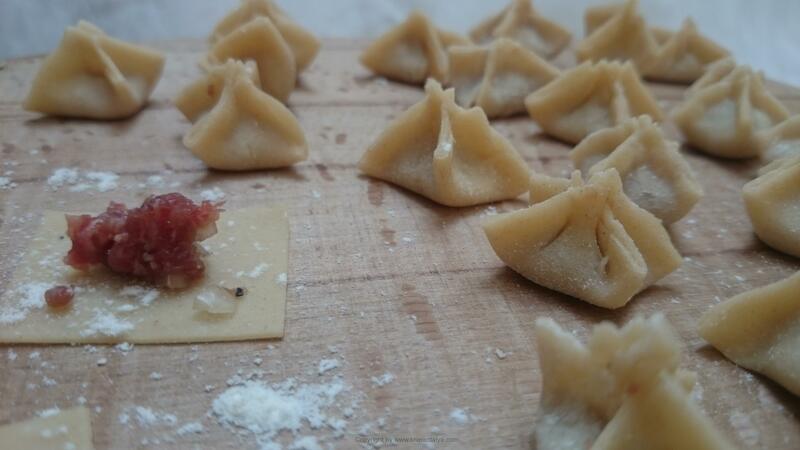 Present the Manti immediately or sprinkle a little olive oil over, to prevent the paste stick together. Some mix the paste with the youghurt right away, but I serve them separately, so you can determine the amount yourself. 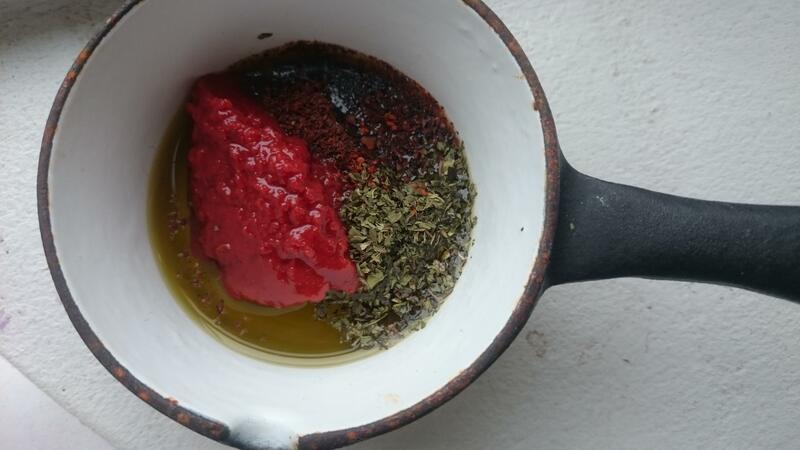 Sprinkle a little oil mixture over your portion and possibly add some extra chilli and mint, if you’re into it. « Hvad skal man se i Antalya?